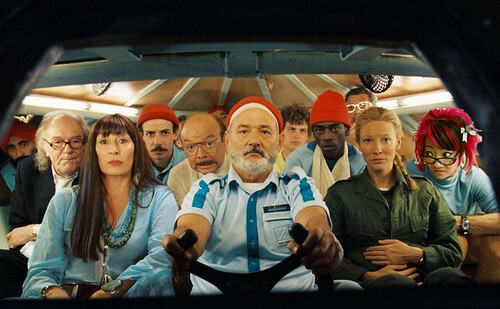 The Life Aquatic is one of my favey fave movies. I wanted them to come out with a ton of Team Zissou memorabilia, but mostly all you could find was red hats!!! 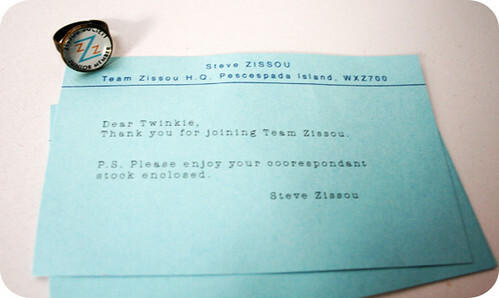 Anyway, I randomly searched Etsy for Zissou swag recently, and I bought a Team Zissou Ring!! Proud Junior Member!! Join the team at Steve Zissou’s Etsy shop hehehe. 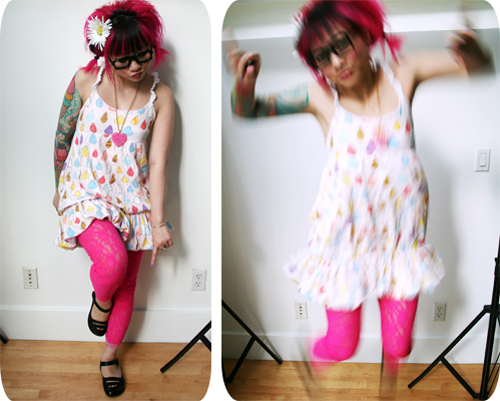 Shoes: Miz Mooz. I’m actually just trying to wear these as much as possible and break them in so that they don’t break my feets when I take them to the East Coast next week! OMG! I love that movie! Totally awesome.. I am now investigating my own junior membership! oh look, I found a comment of yours I didn’t respond to. Did you get new specs and I missed it? Well, I did buy new frames, but I didn’t put lenses in them yet….. There is something about them…I think the bridge is too wide, so I can kind of see it in between my eyes. I don’t think that’s good for your eyesight HEHEHEH especially as an everyday pair! I’m not sure if the site is still up, but you can print all the documents there for free, too. However, the site doesn’t contain that amazing TZ ring! THank you! Nicole is the bestest! The shop does not have much stuff! Did you get anything? Thank you! All your little stuffies are really cute. Do you vend at the craft fairs in the Bay? Ooo Thank you:) I have done 2 very small ones in santa cruz and 2 baz biz’s 1 being the last winter one that I sorta met you at but I was nervous/cold/tired :/ and I didnt go the 2nd day. I’d like to do more but I’m wary of people. omg I am a big ree-ree!! Sorry!! Now I remember who you are!! SHEEESH!!! I am getting really senile!!! Yeah whenever I do them, I’m like, “I’m never doing this ever again.” And then I go and do it again. OMG THAT IS SO HILARIOUS!!!!!!!!! Wear em low. I haven’t seen handmade nation yet! Thank you thank you 😀 ps. you should enter my poilu giveaway! 3rd post down on my blog.